The following is an excerpt from a series of essays entitled “Towards Conservative Christian Church” (parts 17 and 18). The series continues at Towards Conservative Christianity as well as Religious Affections. One of the most difficult tasks facing the conservative Christian pastor is teaching that the affections are shaped, and that Christians ought to give attention to what shapes them. Once again, most Christians live with an incorrect view of the affections. They see the emotions as more or less reactions to various stimuli. In that sense, their focus is merely on controlling (or suppressing) emotional expression. They become oblivious to the whole discussion of shaping or molding the affections, and tend to regard such discussions as extra-biblical pontificating or even legalism. However, if we see the affections as expressions of value or worth, or more simply, our loves, it becomes obvious that what we love or treasure or value can be shaped. We do not love all things immediately, but learn or acquire some loves over time. We can grow certain loves, and weaken others. The problem we encounter is that the loves are not under our direct control. While some of our loves may have been pursued by an act of will, others have been picked up without our knowing why. Many of our loves are loves that grew because of what our family loved, what our peers loved, what was loved by people we respected. Some loves came very late in life, while some were there early. Some loves were hard to develop, while others seemed almost natural. Not many people can explain why they love what they love without some serous thought. The affections do not come by sheer acts of will. The fact that we have a responsibility to shape our loves to be ordinate, alongside the fact that these affections are not all seemingly under our direct control, leads many to deny that such a responsibility exists. It is at this point that many call the affections mere expressions of personality, personal preference and varying tastes. And since no one wants to pass judgment on these things, the discussion is given up altogether. After all, God would only require us to change those things that we can directly change, right? I sometimes wonder if this kind of thinking comes from imagining humanity as some kind of machine or computer. You hear this kind of language all the time: our brain is a “supercomputer,” the body is “an amazing machine,” thinking is allowing people to “process things,” to ask for people’s views is to look for “inputs” or “feedback,” people tell you that they are just “wired a certain way” and so forth. With this kind of idea forming the backdrop of our view of man, we can easily see sanctification as a matter of “entering the right information” so as to “gain the right outputs.” To be honest, some biblical counseling material sometimes makes it sound that way. When you think of mankind like this, you believe every issue is a matter of finding the right Bible verse, programming it into the CPU, and looking for obedience as an output. This then, is sanctification. None of that elusive affection-shaping stuff. Just give me the “put off/put on” pair of verses, and I’m on my way. Unfortunately for this theory, we cannot so lightly dismiss the place of the affections in the make-up of man. Our nature will have its revenge on our mechanistic views of sanctification and prove them insufficient to replace inordinate loves (i.e. lusts), with ordinate ones. Nor can we deny that the affections must be shaped (Phil. 1:9-10, 1 Thess. 5:21). And we cannot deny that their shaping involves matters not under our direct control. This then brings us to the sixth mark of a conservative Christian church: understanding and teaching the means of furnishing the inner life with those ideas and images that encourage these loves and affections. We turn our attention to that next. The first and greatest commandment is to love God ultimately. Immediately after giving this command, God insisted that this kind of ultimate love be the most conspicuous reality in the homes of His people. Deuteronomy 6:6-9 are commands to structure the home and family life so that loving God is taught through conversation and life indoors and outdoors, at rest, at work, when the day starts or when it ends. God wanted this kind of love for Himself to be as prominent as one’s own hand, as visible as something stuck in front of the eyes. He wanted it to be something His people would know every time they entered or left their dwelling. God’s intention was not that His people would wear strips of leather on their forearms, tie boxes with the law between their eyes, or place tiny versions of the Shema in little receptacles and stick those on their doorposts. God was figuratively teaching that love for Him ought to saturate the home-life of His people. Deuteronomy 6:6-9 gives us a helpful take on how the affections are shaped. Certainly, the Hebrew parents were to teach their children to love God, quoting the very words of Scripture and explaining them. There was a cognitive, intellectual aspect to shaping the affections of the Israelites. They needed to know that loving God ultimately was their obligation, and they needed to know why He was worthy of such love. What we love is very much informed by intellect, refection and learned moral precept. However, God’s words reveal that the shaping of the affections is not an intellectual exercise in the strictest sense, at least not merely an intellectual one. God’s words did not mean that He wanted the Israelites to discuss nothing but loving Him in every situation and on every occasion. Rather, God was commanding that parents should structure the environment and atmosphere of their homes so as to cultivate a sensibility of love for God. It is not merely the cognitive instruction on loving God that counts, but the myriads of cultivating influences that express or explain what loving God means and why loving God is beautiful, sensible, wise, compelling and even obvious. It is one thing to gain an understanding of what is true. It is another matter to gain appreciation for that truth. It is one thing to know that something is worthy. It is another to sense the worth of it. The first category are matters of cognition, while the second are matters of affection. How would a child of Israel gain not merely assent to the truth claim that Yahweh alone is God, but proper affections with respect to that truth claim? By hundreds of daily shaping influences. It would be cultivated through what the parents loved. What did the parents prioritize? Was the worship and service of Yahweh first? Did they embrace sacrifice and inconvenience to worship Him? How did their treatment of Him compare to their pursuit of food, or honor or wealth? What sort of time did they devote to God? How much pleasure did they express in God? When they spoke of Him, how did they speak of Him? When they spoke to Him, how did they speak to Him? In relating to one another, how did husband and wife display the meaning of being in a covenant relationship with a loving God? How did their authority, instruction, chastening and exhortation of their children reveal the meaning of knowing and loving God? In other words, the loves of the parents would inevitably be communicated to the children. Example is a major part of why we love what we do. The prejudices, sensibilities, priorities, pleasures and attitudes and tastes of our family, our peers, our church and the wider culture tend to shape our own. Beyond that, Israelite family life was filled with custom, ritual, and tradition. The parents were to be faithful to keep the daily, weekly, monthly and yearly routines of prayers, feasts, celebrations, days of worship, days of assembly or other ceremonies, not to mention all the civil and ritual laws. Through these tangible routines and habits of life, the Israelite’s life was filled with analogies to explain not only who God is, but how His people respond to Him. These features of life helped him know the difference between the holy and the common. They provided sensibilities about the truths he knew. In attending worship, he heard the prayers and songs of Israel and was catechized as to how God’s people love Him. By hearing, seeing, touching, smelling and tasting Sabbath meals, slaughtered animals, Solomonic choirs, golden menorahs, Davidic poetry, priestly incense, accounts of the Exodus, unleavened bread, kingly authority, Jubilee celebrations and hundreds of other things, the Israelite gained living metaphors of truth that evoked and shaped his affections. The affections of Israel were shaped when they were exposed to forms used by God to help His people rightly respond to the truths they knew. Apart from God’s revelation, none of these forms would shape ordinate affection. But assuming its presence, faithful exposition of it, and Israel’s practical submission to it, the forms were a necessary part of shaping the religious imagination of the Israelites. And as Tozer said, what comes into your mind when you think about God is the most important thing about you. I just wrote a dissertation on this very topic, and I agree with the author's "unsupported statement." 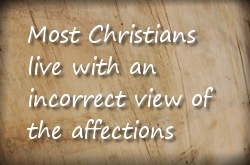 Most Christians, in my opinion, do live with an incorrect view of the affections. I think the author is on to something when he points to computer terminology invading our sensibilities—sort of the reverse of anthropomorphism! But, of course, the problem goes further back, to the Enlightenment most proximately. Many different groups of people have spoken of the emotions as if they are fallen and of reason as if it were not. One of the most important statements de Bruyn makes is, "The problem we encounter is that the loves are not under our direct control." Amen. I think this focus makes the first half of this article truly excellent—I'm going to hold on to this material. The second half, however, leaves out what I believe to be the most important answer to the problem of our loves—while providing some very good scriptural counsel that gives us the second-most important answer. The decisive factor in our loving is not environmental factors. Many children have been raised in God-loving homes and have left for the mud pits of the world (Jer 2). The decisive factor is God's Spirit. The natural man does not welcome the things of God's Spirit because they are "Spiritually" discerned (1 Cor 2:14). Only through a divine renovation of the heart can anyone love God rightly and fully. The regeneration provided by the New Covenant (Jer 31) is what we need. The Israelites didn't have this and therefore could never as a society fulfill the Deuteronomy 6 ideal. The church has it, however. That raises the question of how regenerated people can rightly order their loves when they find them out of order. But it's time for lunch... I'll only say that the divine ultimacy in regeneration does not get flipped on its head for sanctification. When I find that I don't love as I ought, I read the Bible and pray and use the other ordained means of grace. I don't have full control of my loves. All in all, a good article. The unsupported statement is his opinion. The point of this one is not really to prove that folks are confused on this point but to develop some solutions. But when he goes on to describe how people think of their emotions, that's pretty much how just about everybody I know (who I've had a chance to observe on this point) thinks of them. It rings true. ... as does the idea that our loves can be intentionally shaped. I should point out again, too, that this article is a couple of installments in a lengthy series. It may well be that he has provided some direct arguments in support of many of these ideas earlier in the series... and may also get to the regeneration point as well. David has a comment on that in the next essay (which was posted on his blog on August 5) where he says toward the end of the essay: "There is a change for limited success with our adult members, and perhaps a higher chance of success for the children that grow up in church devoted to cultivating ordinate affection (assuming they trust Christ when they are able to. Part of our task may be to keep some things alive and available for future Christian generations who will be better prepared to receive and appreciate them." Thus, he does question the effectiveness of this for the unconverted. The whole series is worth reading, but I don't think he is finished. Glad to hear you finished you dissertation, Mark. Well done! "change" should have read "chance"
One of evangelicalism's most interesting philosophers, James K A Smith, wrote on this topic in his book Desiring the Kingdom. Check it out if you haven't already. All this talk of affections is really just good old Augustinian theology. The decisive factor is God's Spirit. The natural man does not welcome the things of God's Spirit because they are "Spiritually" discerned (1 Cor 2:14). Only through a divine renovation of the heart can anyone love God rightly and fully. The regeneration provided by the New Covenant (Jer 31) is what we need. The Israelites didn't have this and therefore could never as a society fulfill the Deuteronomy 6 ideal. The church has it, however. 2. (off topic) The OT saints weren't regenerated? One of the most powerful and enduring notions that has stuck with me from reading his Confessions was his pear-stealing story. I don't want to retell the story here at the moment because time is short. But the part that gripped me as true (and "wow" for lack of a better word) was the idea that we are sinning on the worst scale when choose to do something because it's wrong. Even if the act itself is small (like taking some pears from a guy's tree as a teen), the wickedness of heart can be huge. It's a whole different way evaluating the scale of wrongness in the things we do: with what we desire as the critical factor.